It’s my job as a parent to protect my children from the evils of the outside world. Whether it’s the harsh reality that we call today’s news or language that young ears shouldn’t hear, we have always been careful about what we expose them to. Sheltering them until the time was right to gradually let information leak out and start conversations. Movies, books and games have been a good way for us to introduce difficult ideas along the way. 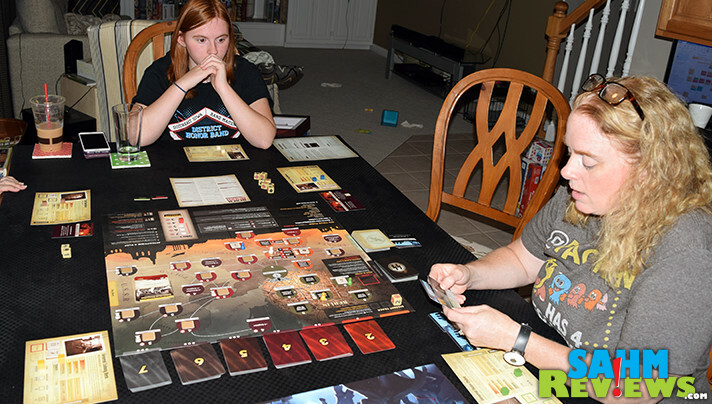 Over the past several years, board games about history have been instrumental in teaching the girls about war and the individuals who shaped the outcomes – both good and bad. They were in junior high when school curriculum introduced them to Nazi Germany and one of the most horrific leaders to ever walk this earth, Hitler. Scott lived in West Germany for several years during his youth and would share stories about taking the train through East Germany into West Berlin. We used that as a launching point for conversations regarding the events of the reign of Hitler. Games are a natural way for us to engage with the girls, but until now, we haven’t had a game that would allow us to talk in depth about him or the details of Hitler’s undoing. 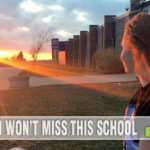 How does a parent even talk about the atrocities committed during this time? Carefully. 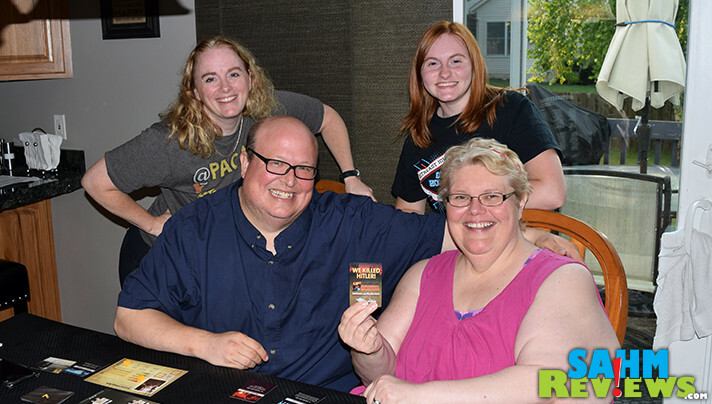 While attending Origins Game Fair, we picked up a copy of Black Orchestra from Starling Games. 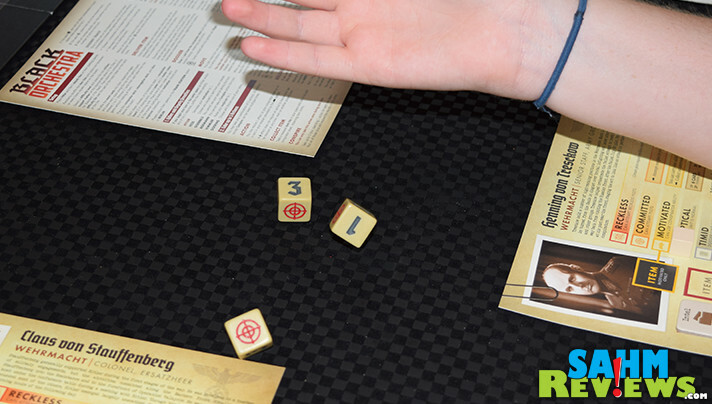 This cooperative game shares the story of how Hitler’s inner circle worked in secret to overthrow him. We learned plenty about Nazi Germany in one afternoon of playing Black Orchestra and we had fun in the process. 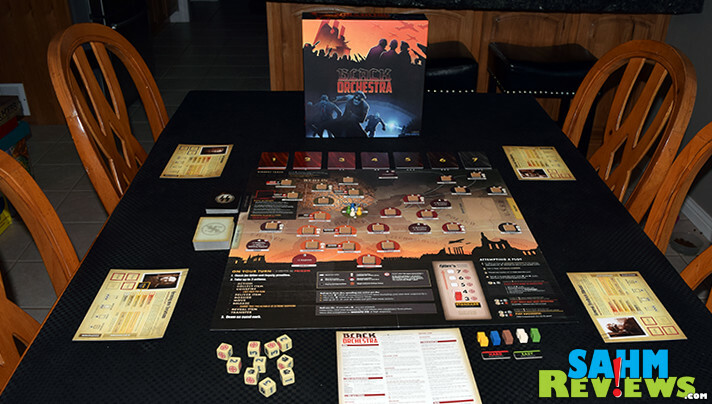 Black Orchestra accommodates up to 5 players who are working together to carry out their various plots to assassinate Hitler. Characters include a mix of Abwher (German military intelligence service), Wehrmacht (armed forces) and civilians, each with unique special abilities that can be activated when they become motivated. 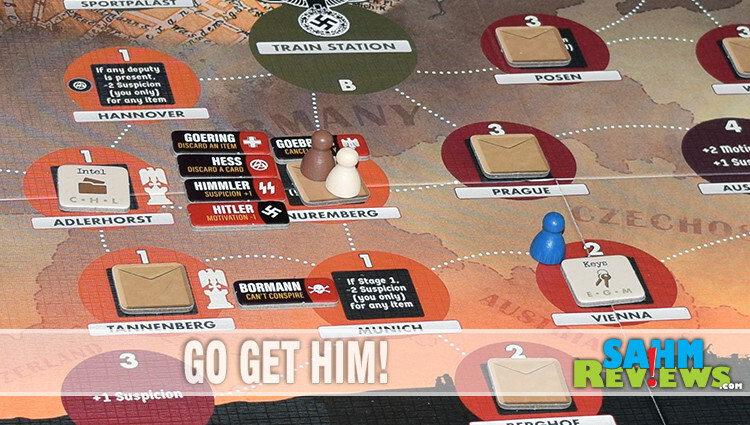 Each player selects one character, the board is populated with item tokens and Hitler plus his leaders and his deputies are assigned to various cities as noted on the board. Cards are shuffled and two randomly removed from each of the seven stage decks to ensure each game is different and unpredictable. 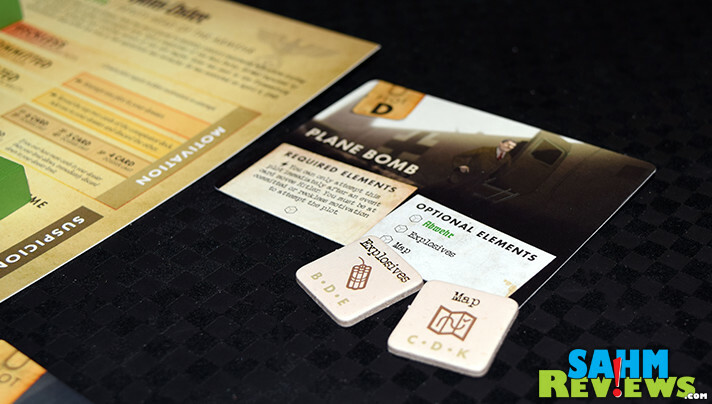 Interrogation and conspirator decks are prepared and placed in their designated spaces next to the board. The goal of the game is to assassinate Hitler before one of three things happens. If everyone ends up in prison, you lose. If the “documents located” card is drawn from the Stage 7 event deck, you lose. As previously noted, two cards are randomly removed from each stage of the event track so it’s entirely possible this card won’t be in your deck, but you won’t know until the last card is drawn. Finally, if you run out of cards in the event deck before assassinating Hitler, you lose. So how hard can it be to complete a plot? As was true in real life, many people lost their lives trying to achieve this goal so don’t expect it to be easy. What’s interesting is that each character card shares the true story of each of these individuals including their positions of power and influence as well as details of their assassinations. The cards have sections labeled “Motivation” and “Suspicion” which impact actions that you’ll be able to do. You are able to take on more duties (hold more Conspiracy cards), undertake a plot attempt and utilize your special abilities when your Motivation is elevated. When you’re Suspicion is low, you’re able to sneak around under the radar, but when you reach the level of Extreme, you are under the watchful eye of the military. Not only are you not able to take part in assassination attempts, but can easily be sent to prison if a raid occurs. In case you’re curious, we implemented a house rule stating a limit of two Hogan’s Heroes references per game. Your character card holds items you’ve picked up from locations on the board or received from other players. 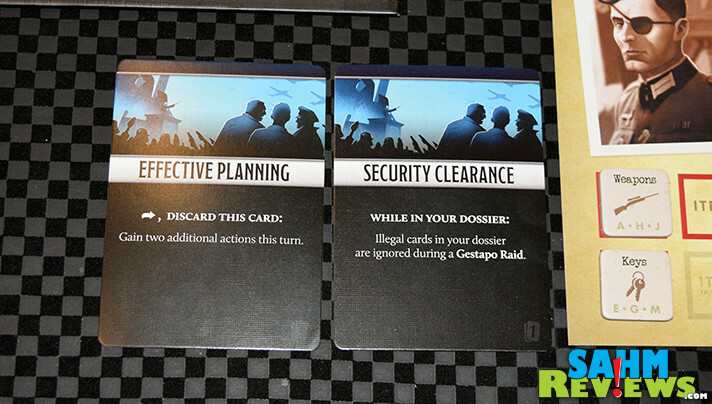 Designate an area near your card to use as your dossier to hold your plot documents and other conspirator cards. On your turn, you’ll take up to three actions. You can find them all listed on the board but they include Movement, Revealing, Collecting, Delivering or Transferring Items, Conspiring, Acting on a Dossier card, Adding to your Dossier or Attempting a Gestapo release. To move between spaces on the board, it takes one action per space except for Berlin which is one space between each spot and the train stop. If your Suspicion level is low enough, you can make your way to the Gestapo HQ to free your fellow conspirators. If you happen to find yourself in prison, your turn is relegated to an interrogation. We can’t talk about what happens with that. It’s a rule of the game to keep it secret! You can also use actions to take a card from the conspiracy deck. These include a number of different types of cards including plots, illegal activity, items and actions. Some require use of an action during your turn while others are instant and can be played during other people’s turns. There’s a limit on how many you can hold so use them as you need to. While being very powerful, illegal conspirator cards have negative implications when there is a raid. If you feel like you don’t have enough actions, you can conspire to get more. To do that, simply roll a die. You can roll one die for each action you want to chance. If you’ve taken two actions and only have one left, you can roll the die to see if you can earn more. Each die contains two targets, one Federal Eagle and the number 1 through 3. If you roll a number, you get that many more actions. 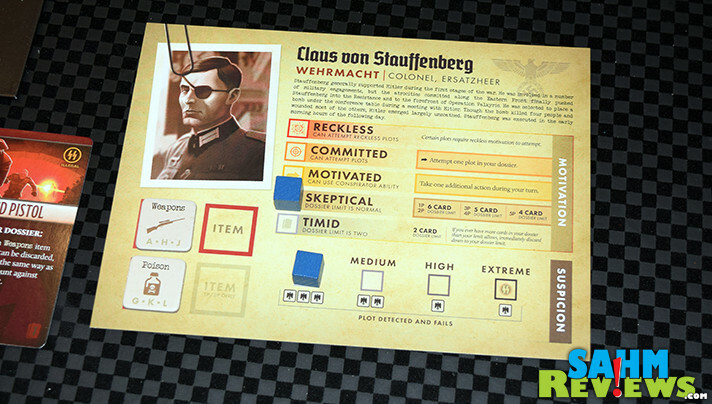 Any target that displays goes onto the Dissent track which allows players to lower Hitler’s Military Support level or increase one player’s motivation level. Each Federal Eagle you roll raises your suspicion level by one. And if you happen to be sharing the space with another conspirator, their level increases as well! If you attempt a plot to kill Hitler, you need to roll the number of targets without rolling a Federal Eagle. If you’re able to roll enough to meet or exceed the number on Hitler’s Military Support then you win. Except… if you roll a Federal Eagle. In that case, you are arrested and sent to prison. 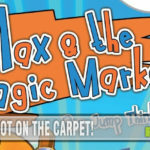 At the end of each turn, a card is drawn from the event stage deck and followed accordingly. Some are raids, others raise the military level or impact player suspicion or motivation levels, some move Hitler or his leaders to other cities and others refer to key events in history. I cannot say enough how much fun we had playing Black Orchestra while learning about history at the same time. Even when it wasn’t necessary, we found ourselves reading the historical flavor text that was added to the cards. The game is available from Starling Games’ website or you can pick up a copy of Black Orchestra on Amazon. 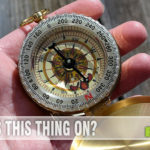 Find out what other games they have in their arsenal and learn about news and announcements by following Starling Games on Facebook and Twitter. Whether you are looking for a historically-based game or one that is cooperative, this is worth checking out. Add the movie Valkyrie to the schedule and you can learn a lot about this time in history all through entertainment. What are your thoughts about a game based on killing Hitler? Oh I like this. It sounds so fun and I love any game the whole family can play! I like this idea. 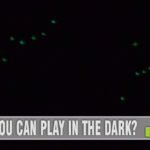 I could play this game for sure, my husband and oldest would no doubt like to play with me too. Black Orchestra looks like a fun game to enjoy. I have not even heard of it before, as usual, you share such interesting game ideas. I love this one. Ooooo now this sounds like my kind of game! I love that the characters are all real people. Makes it more interesting that’s for sure!